Hands rest on the ball. Raise your arms up off the ball keeping your elbows bent at approximately 90 degrees. Back extensors, scapular retractors, infraspinatus, supraspinatus, posterior deltoid, glutes. If you find this too difficult at first, try keeping your hands lightly on the ball as you raise your chest. Squeeze your shoulder blades together as you rise up. Even a small amount of movement is beneficial. 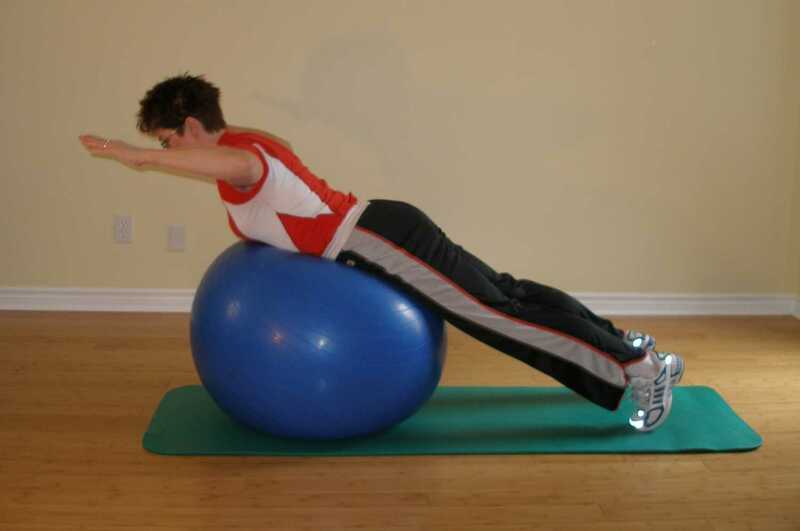 Try lengthening your lever as in the exercise Back Extension 2. When learning how to perform this exercise, prop your feet against the wall and let a bit of air out of the ball. Be careful not to hyperextend your back. Just raise your trunk so that you form a straight line from your feet to your shoulders. While some people go further and hyperextend their back doing this exercise, it's not very functional and not tolerated well by everyone. Click here for more information on back exercises. Repeat this exercise ball exercise 12 times.